Instead of looking into the substance of the story, the media have gone after the undercover journalists who exposed Planned Parenthood’s trafficking in human flesh. 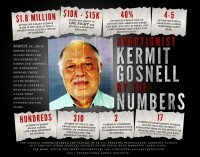 Pedro Cortés’s agency ignored reports about Kermit Gosnell’s abortion clinic butchering women to death. And new Gov. Tom Wolf has just reappointed him. Women’s health risks for death, breast cancer, hemorrhage, and other maladies as a consequence of abortion increases at 20 weeks pregnant and following. The media refuses to even be curious about the reality of abortion. Another pro-life filmmaker has been told his crowdfunding efforts on Kickstarter will be denied. This time for even more dubious reasons. Should Unborn Babies Be Used To Heat Hospitals? Do pro-choice activists think it’s in any way wrong to use unborn children for heating fuel? And, if so, could they explain why? Why Is Planned Parenthood Working To Unseat Gosnell Victim’s Cousin? Abortionist Kermit Gosnell butchered her cousin. She voted to improve clinic conditions. Even post-Gosnell, Planned Parenthood views that as unacceptable. A blind, stupid, uncomprehending press cannot really be a free press and its result—a society that cannot really think—cannot really be a free society.